For the first time in many years I will be exhibiting at a fair with my good friend and collaborative partner Sarah Parker-Eaton! 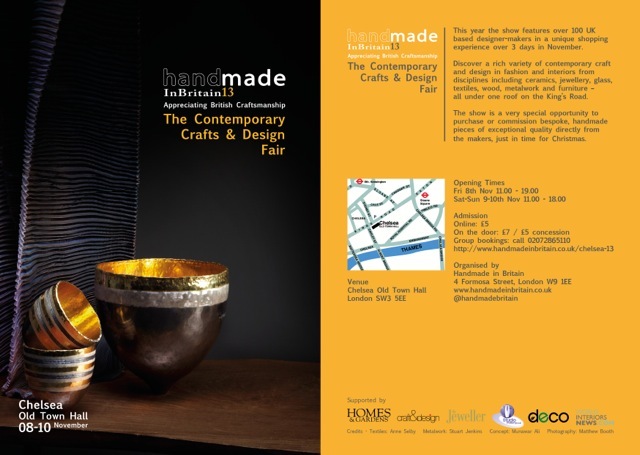 We will both be at Handmade in Britain this year – stands 27 and 28 from the 8th – 10th November 2013. Find out more details at Handmade in Britain. This year will be Handmade in Britain’s seventh at Chelsea Old Town Hall and once again, their annual showcase will begin the Christmas season with exceptional craft and design from over 90 designer-makers. This year’s show will feature exhibitors in all disciplines including furniture, jewellery, textiles, ceramics and glass – all with a focus on absolute quality and craftsmanship – whose work is available to purchase or commission directly from the maker. Alongside our established makers, this year we are very excited to launch our New Graduate Showcase, a celebration of new talent in a dedicated gallery at the heart of Handmade in Britain 13. This entry was tagged craft fair, purchase. Bookmark the permalink.